The new order follows an order placed with Konecranes only last autumn. The floating cranes contribute to the continuing growth of Winning’s bauxite handl- ing activities off the coast of Guinea, Africa. They play a key role in the supply chain, trans- shipping bauxite from river barges to Capesize vessels on the open sea. 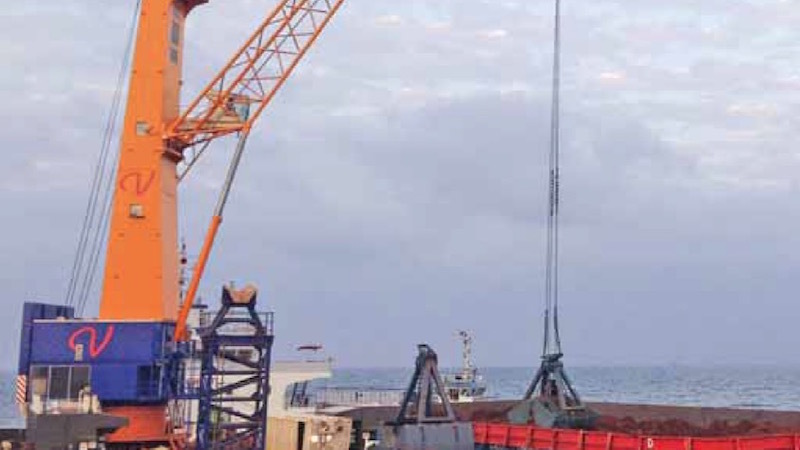 Built for use on the open sea, the Model 8 floating cranes with a maximum outreach of 43m and a powerful 63- tonne grab curve are designed in accordance with Lloyd’s Register Code for Lifting Appliances in a Marine Environment. This allows them to operate at wind speeds of up to 24m/s and at maximum wave heights of 2.5m. Konecranes is a world-renowned group of Lifting BusinessesTM, serving a broad range of customers, including manufacturing and process industries, shipyards, ports and terminals. It provides productivity enhancing lifting solutions and well as services for lifting equipment of all makes. In 2017, group sales totalled €3,136 million.